I've seen it, as recently as this past week, when a friend offered me a lift and her two young daughters were text messaging each other -- in the back seat of the car -- seated right next to each other. But these days, the phenomenon of "texting" has also found its way to family dinner tables, including important holiday meals such as Thanksgiving, Christmas, Easter, breaking the fast on Yom Kippur, Passover -- you name it. According to Emily Post’s great-granddaughter, Cindy Post Senning, it's called texting anarchy, and "People are texting everywhere," she says. Husbands, wives, children and dinner guests who would never be so rude as to talk on a phone at the family table seem to think it’s perfectly fine to text (or e-mail, or Twitter) while eating. But Dr. Post Senning says that it's not perfectly fine. Not at all. So new is the problem that her latest book, Emily Post’s Table Manners for Kids (HarperCollins, 2009), written with Peggy Post, covered it only generally, in a blanket ruling: "Do NOT use your cell phone or any other electronic devices at the table." Yep, seems it's a new term for a winery whose vineyards may be located in one place, but seeks to associate itself with another area. In a profile of wine mogul, Fred Franzia, the May 18, 2009 issue of The New Yorker describes how Franzia's popular "cheapie" Charles Shaw wine, also known as Two Buck Chuck at Trader Joe's, gains from the prestige associated with the Napa Valley wine region -- where it is bottled -- even though it is made from grapes grown in vineyards in California's less desirable Central Valley. 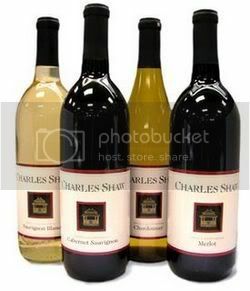 Although Charles Shaw wine falls under the generic California branding, it can legitimately be labeled "Cellared & Bottled by Charles Shaw Winery, Napa, CA," a practice that strikes many in Napa as a bit unsavory. "It’s called a Zip Code winery," Vic Motto, a business adviser to Napa Valley wineries, says. "The unsuspecting consumer may not realize it’s not Napa wine." This sort of reminds me of the rumored waters from the French Alps -- which actually start out from a kitchen tap somewhere in The Bronx. On the other hand, the "bottling" is probably happening in The Bronx too...but you get the idea. 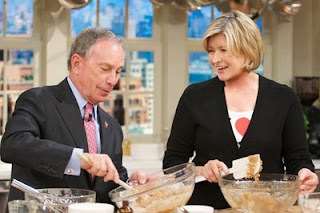 Straight from the "The Martha Stewart Show" are these sound bites from Mayor Michael Bloomberg's appearance this past week on the daytime television show. MS: When people ask you about New York City, what are the three things…that are absolutely important for out-of-towners to do, to see, to visit? MB: Well, number one, I would take the Staten Island Ferry over to Staten Island – get off. There are lots of cultural things on Staten Island, but even if you don’t have time to do that, take it over and back. It’s free and you get a phenomenal view of the Statue of Liberty and Ellis Island and the skyline of Brooklyn and Manhattan. MS: You don’t know this, but do you know what happened to me on the Staten Island Ferry? MB: Mazal tov! I wont asked what happened after that. MS: Well that’s history, but it was very exciting and the view is very nice. MB: I used to buy a six pack of beer and a pizza and take a date…it was very romantic and something I could do. The second thing I would do is go to a Greek diner. Greek diners are something that is unique to New York. There’s a thousands things on the menu; they all cost about five bucks; they come in 30 seconds; and they all taste good. If I was going to eat every meal for the rest of my life in one restaurant, it would be a Greek diner…and then I guess the last thing I would do…Broadway show. Hmmm... A six pack and a pizza on the Staten Island Ferry, eh? Sounds like a real "low budget" date, for sure. But hey, um... "when" exactly are we talking about here, Mr. Mayor...Bloomberg?? Don't know about the rest of you moms out there, but I personally can't think of anything I'd like more for Mother's Day, than my all-time favorite, Red Velvet Cake. This cake is a southern tradition for festive occasions. It can be completely assembled and chilled one day before serving. And…it can also be totally pimped out and "jazzed" up with raspberries and blueberries (as seen in the picture above). HAPPY MOTHERS DAY, ONE AND ALL! Divide batter between prepared pans. Bake cakes until tester inserted into center comes out clean, about 27 minutes. Cool in pans on racks 10 minutes. Turn cakes out onto racks; cool completely. Beat cream cheese and butter in large bowl until smooth. Beat in vanilla. Add powdered sugar and beat until smooth. Place 1 cake layer, flat side up, on platter. Spread 1 cup frosting over top of cake. 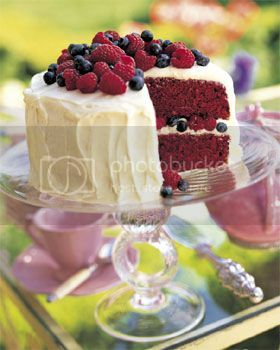 Arrange 1 basket raspberries and 1/2 basket blueberries atop frosting, pressing lightly to adhere. Top with second cake layer, flat side down. Spread remaining frosting over top and sides of cake. Arrange remaining berries decoratively over top of cake. If you knew her, you also knew that the late, great Julia Child disapproved of using her name for anything deemed "commercial." It was so much so – that she even refused to put so much as a blurb on the back of a book for some of her closest friends. The movie is an adaptation of two books: Julie Powell's Julie & Julia and My Life In France by Julia Child with Alex Prud'homm. 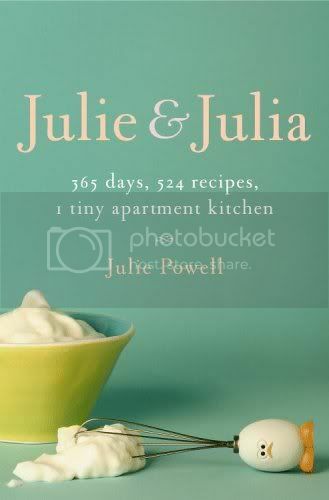 By the way, if you'd rather skip the movie, but still interested in a good read, then I highly recommend former food blogger Julie Powell's award-winning book titled Julie & Julia (mentioned above). I read it several years ago when it was first released – and totally loved it.